Merida is a beautiful city in the heart of the Yucatan with fantastic examples of Spanish colonial architecture dating back to the 16 and 1700's. The sheer age of this city gives it an old world flavor, but the fact that so many of these structures were built to last has enabled a level of preservation that makes you feel you have stepped back in time. With a population of a million people, it often feels like the city is expanding and stretching towards Uxmal, Chichen Itza, Mayapan, Kabah, Labna, Edzna, Sayil and more. Yes . 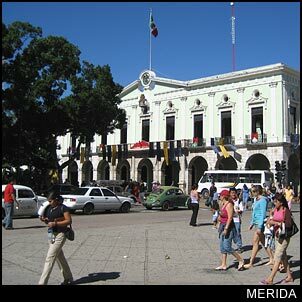 . . Merida Mexico's heart was built by its conquerors hundreds of years ago . . . but it was built with stones from a civilization which was there more than a thousand years before the Spaniards arrived. The jungle has overgrown and hidden many of the archaeological sites in the Yucatan . . . but there was once a time that you could walk for days and not be able to tell where one city ended and the next began. You say that you want to visit a place that isn't just another Americanized theme park? You want to experience the true flavor of Mexico and its people? You want to immerse yourself in the Mundo Maya (Mayan World)? You want a vacation that makes you feel like Indiana Jones? If that's what you want, Merida Mexico is the place for you.